Since its establishment in Feb. 1991, travel-and-tours company Profil Holidays, a subsidiary of TAC Tours and Travel Corp., has helped thousands of Filipinos explore more than 100 countries in five continents, giving them a lifetime’s worth of unforgettable experiences. 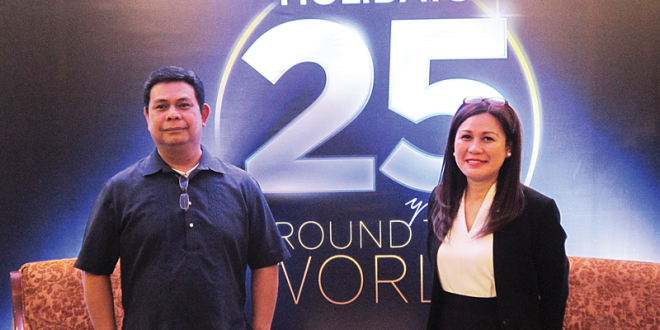 From its humble beginnings in a single 20-square-foot room in Manila at the height of the Gulf War, Profil Holidays has grown into an accomplished travel “wholesaler” that boasts of more than 800 retailers, including agencies such as Air Space, Fiesta, and World Destinations. But despite its well-deserved achievements, Profil Holidays—“Profil” stands for “Professional Filipinos”—remains fueled by its goal to provide services to Filipino travelers that have become the standard in the travel and leisure industry. “I’ve had my fair share of travels. Seeing new (places) helps one gain wisdom and perspective through the (various) environments, mentalities, and cultures that broaden minds and help us think outside the box,” said Rosanna Inciong, general manager of Profil Holidays. “This is particularly helpful in our quest to meet and surpass the current standards in the travel and leisure industry,” she added. One of Profil Holidays’s notable achievements is its pioneering of tours that had never been offered by its counterparts. This made the company the top-of-mind choice for tour operators and travel companies when it comes to better itineraries with more exciting destinations. “Over the years, Profil Holidays (has been) able to expand its network by (building) on (its) strong relationship with more than 300 partners, 45 land handlers, 15 sightseeing firms, 10 hotel firms, two appointed general sales agents, and a fleet of partner airline companies,” Inciong said. She revealed that, of the sales Profile Holidays have generated in the last few years, 60 percent come from its European packages, 20 percent from its Mediterranean and Holy Land tours, and the rest from packages involving other nations, among them Australia. It also launched new travel packages, including the “Europe by Rail” packages, in which budget-conscious travelers can pick from any of these three grouped destinations: France, Switzerland and Italy; France and Spain; and Denmark, Finland, Norway and Sweden. Features of the Travel Scout, developed by digital-advertising company Binary Digital, include a currency converter, multicity weather-forecast guide, expense calculator, world clock, pack list, travel log, and an automatic alarm that syncs to your mobile phone’s calendar. According to Binary Digital Managing Director AJ San Pedro, an offline map and a do-it-yourself list shall be added to the app in the future. For more information about Profil Holidays, visit www.profilholidays.com or www.facebook.com/profilholidays.